Weather conditions are so perfect now for the hills I decided to take a day off work and head to Donegal to tackle Slieve League and especially see if I had the nerves for the "One Man's Pass" so highly commented on in Mountain Views. Arrived at Bunglass car park at 11am, surprised to discover no other walkers on this most beautifull day. A notice advises that ongoing maintainence work is in progress and asks walkers to use the Pilgrim Path if possible - well having driven three hours to reach here I was not going to miss out on the clifftop walk so took my courage in my hands and headed off. There is a lot of erosion on the route in boggy/heathery areas, however the views as outlined by other contributers did not dissapoint. I found it tough going not having hill- walked over the winter. On arrival at One Man's pass I did not wait around or look at it too long, having read other contributers musings I just scrambled over, the fact that I had a heavey rucksack on board that slipped to one side midway over caused the old sphincter muscle to contract and I was glad to see the other side and terra firma or better still "terra more" to stand on at least. Onwards with renewed vigour and took in all the views out towards Raithlin O Beirne on one side and the Bluestacks on the other. Was disgusted to come upon some Graffiti sprayed on a rock by some mindless idiot (see photo). 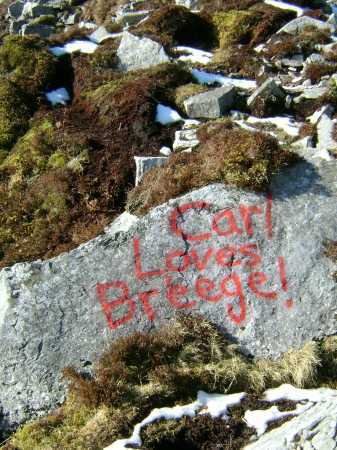 By all means Carl show your love for Breege, you don't have to deface a beautifull area to proove it !!!!. Had to march over some residual snow before reaching the broken Trig point .